If you are planning to start a comics museum now, you will never catch up to the Billy Ireland Cartoon Library and Museum. I had thought that La Cité internationale de la bande dessinée et de l’image in Angoulême, France, might have a bigger collection, but it "only" has 12,000 piece of original art. The Billy Ireland may have the largest collection of comics art in the world. It's a national treasure and should be a Mecca for anyone remotely interested in comics and cartoons and their history. And for the most part, all these works were donated. (They do have a small acquisitions budget, but it is mainly used to fill holes in their collection of printed material, not to buy original artwork.) 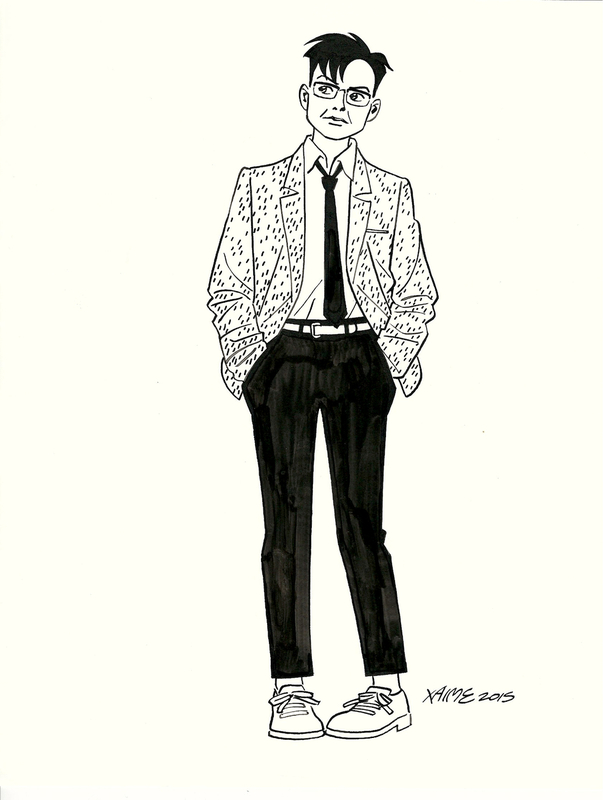 The collection was started when OSU alumnus Milton Caniff, creator of Terry & the Pirates and Steve Canyon, donated his artwork and papers to his alma mater in 1977. 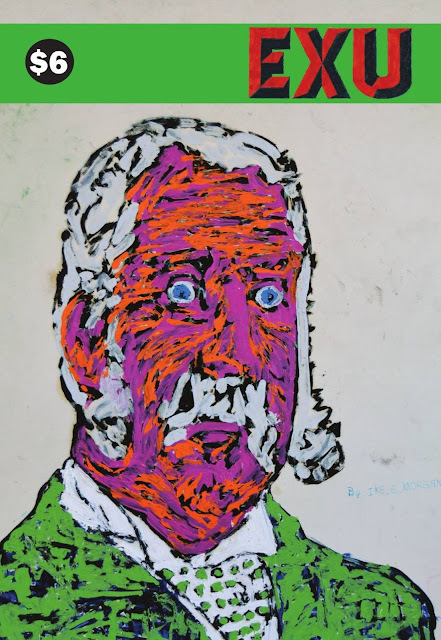 But this kind of gift is not uncommon, and the Billy Ireland Museum wouldn't have become the institution it is if someone hadn't seen that this gift could be the start of something. 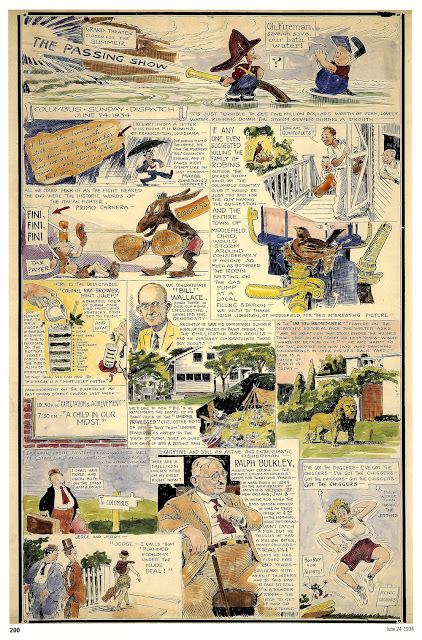 After all, Boston University received Harold Gray's original art after his death in 1968, but thus far, no one has built a museum of comics there. It took a visionary curator, Lucy Caswell, to take Caniff's gift and build on it. I've been thinking a lot lately about the "comics world." There is a term, the "art world", which was theorized by sociologist Howard Becker in 1982 in his book Art Worlds . He defined the art world as "the network of people whose cooperative activity, organized via their joint knowledge of conventional means of doing things, produce(s) the kind of art works that art world is noted for." He had an expansive view--art supply shops are as much a part of the art world as the Museum of Modern Art or Jeff Koons. And the thing about the art world is that it includes a large number of people who do not produce art; people who, for example, study art--scholars, theorists, curators and historians--and institutions that facilitate that--museums and universities. They act as intermediaries between the art world and the rest of the world. They are the ones who are continually making the case for the importance of art to the world. We have relatively little of that in the comics world. For a long time, the comics world was almost completely commercial--people producing comics and comic strips for money and selling them (via publishers and distribution networks) to consumers who liked to read them. I guess if you are a classical economist, this is the only comics world that needs to exist. And people within the comics world often refer to this world as the "comics industry," which really rubs me the wrong way. A strict focus on the commercial aspect doesn't really help an art form. To be really vigorous, art needs a penumbra of activity around the production and consumption of the art itself. As much as some believe in the heroic myth of the lone artist, we need museums and archives and scholarship. We need curated exhibits, popular and scholarly books about art, journalism, criticism and so forth. Despite its primarily commercial nature, the comics world has had at least a little bit of this other stuff almost from the beginning. In addition to being arguably the first comics artist, Rodolphe Töpffer was also its first theorist. Occasionally over the years, critics have looked sympathetically at comics--for example, Gilbert Seldes' 1924 book The 7 Lively Arts . Within the cohort of readers of comic books, there appeared in the 50s and 60s some fans who looked at comics as scholars would--they treated their subject as art history and even a kind of philology as they tried to figure who had written and drawn many of otherwise anonymously produced comics, tried to understand the mechanics of comics, and tried to approach the work critically. They were operating outside academia at first, but eventually entered academia, first through communications departments and later through other departments. (Academically, comics is still an interdisciplinary field.) 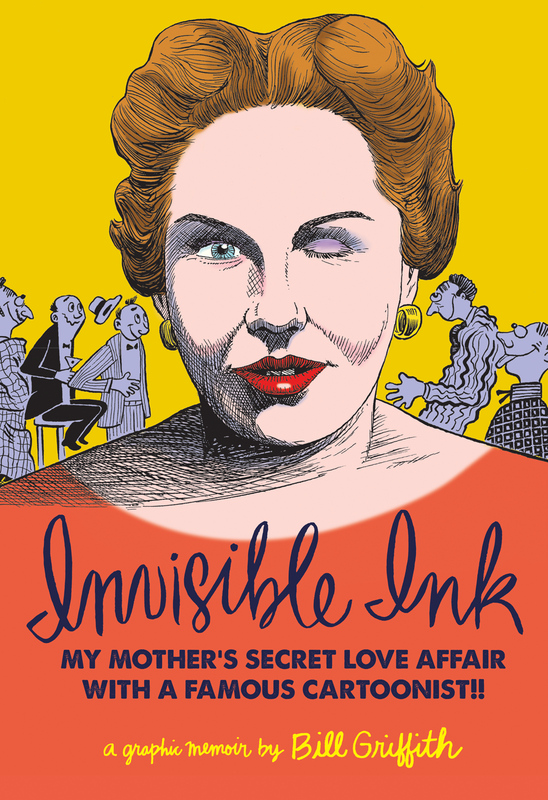 And around the same time, Lucy Caswell was figuring out what to do with Milton Caniff's papers. At the time that I started, there weren’t really the kinds of resources to teach and learn about comics that we have now. So I basically had to make it up as we went along. There just wasn’t anything else out there. As a good librarian and scholar I started writing around to other places that said they had cartoon collections to see how they did things, because you don’t want to reinvent the wheel if somebody’s already figured it out. It turned out that nobody had the kind of thing that we had in the Caniff collection, i.e. so extensive, and the combination of art and manuscript materials. And nobody else was trying to grow it the way we were. Because Caniff lived until 1988, he was able to act as an advocate for the collection when Caswell started trying to expand it beyond one artist. An issue was that no other university had successfully built a long-lived broad-based comics/cartoon collection. This made would-be donors skittish. Caswell added, "We were additionally handicapped by the fact that another university had, in the ‘60s, built a very fine collection of cartoon art. It’s a fabulous collection, and basically they had locked it up when the person interested in that left [the university]" [Tauber, 2009]. But before Caniff died, he was able to help them acquire Walt Kelly's papers and Will Eisner's papers--and possessing the papers of these three comics giants very much helped legitimize the collection. The collection started in 1977 in two converted classrooms in the journalism department. One was for storage, and the other was the reading room. At first it was called the Milton Caniff Reading Room. It went through several name and location changes before ending up in its current building, Sullivant Hall. To renovate Sullivant Hall required $13 million in capital. Big checks from Jean Schulz, the widow of Charles Schulz (who paid $3.5 million), and Sayre Graves, granddaughter of Billy Ireland, (who paid $7 million through the Elizabeth Ireland Graves Foundation) paid for much of the upgrade. An additional $2.5 million was raised as challenge grants to part of the Schulz gift. This fundraising took seven years to complete. Who was Billy Ireland? So many buildings on college campuses are named after some plutocratic alumnus who gave the university a big gift, but in this case, the museum is named after a cartoonist. Billy Ireland was a Columbus cartoonist who drew a resolutely local comic strip called The Passing Show for the Columbus Dispatch from 1908-1935. This strip was a gorgeous piece of work, noted for its constantly changing pictorial logo (kind of the Google of its time). The museum now gives away bookmarks with many of these logos, and has published a beautiful monographic hardcover edition of Ireland's work. It feels very appropriate to name the museum after Ireland--he was a local cartoonist; he was a brilliant cartoonist; and his descendants in the end helped pay for the museum. The facility is on two floors. On the ground floor is a reading room (where if you make arrangements in advance, you will be allowed to examine original artwork and rare publications). On the other side of the two story entry-way are the offices, and it is through the office that one enters the storage area, the heart of the collection. As you walk into the office, you see a wall decoration made out of printing plates with comic strips. You pass into a room where conservation is done, and after a code is punched into a very heavy looking door, into a room for storing original art. Part of this room is a vault with additional security because the pieces inside are especially valuable. The more accessible art shelves are enormous, but considering the size of the collection, it won't come as a surprise to learn that most of the artwork is stored off-site. 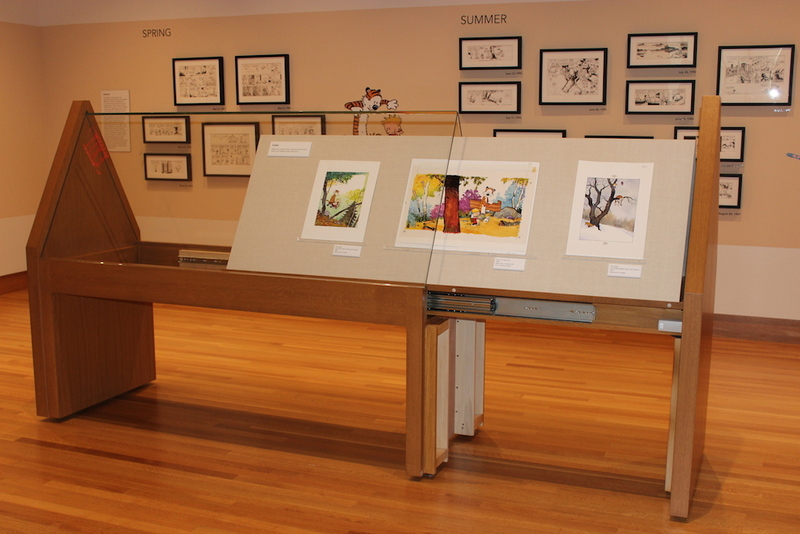 I went on a tour with several cartoonists (including Griffith) conducted by head curator Jenny Robb. Although the public parts of the Billy Ireland museum seem quite large, the back rooms were enormous. As we were being lead through this tour, I wondered if part of its purpose was to convince Bill Griffith that his papers should join this august company. After all, he is an important artist and he is in his 70s, when one must start to think about what will happen to one's life's work. And there were several younger cartoonists on the tour, and if I were Robb, I would want to be planting the germ of the idea of eventually siting their work and papers with Billy Ireland many years from now. The Billy Ireland collection depends on donations of art and manuscripts, after all. And to remain relevant, the Billy Ireland will have to take the long view. 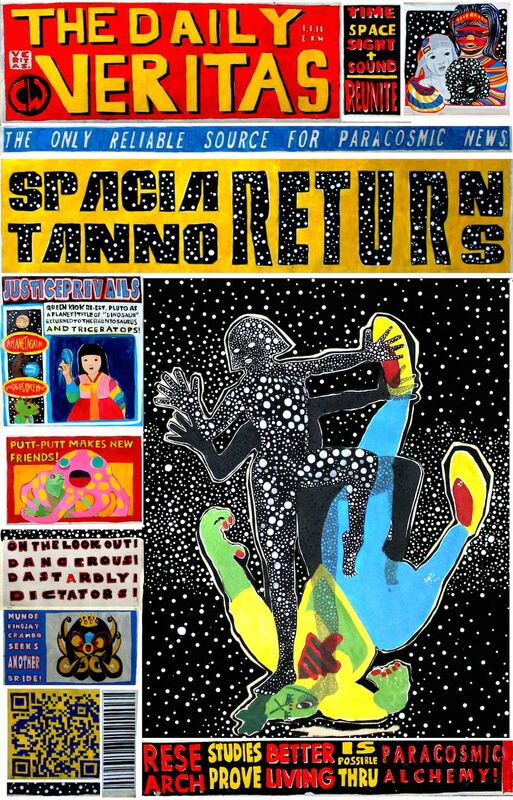 Twenty years from now, Jim Rugg and Dustin Harbin (both of whom I think were on this particular tour) may be precisely the kind of artists that the Billy Ireland museum wants in their collection. So maybe tours like this are the first step in a long, long courtship process. Upstairs is a lecture room and the museum's galleries. I was quite impressed with the museum's fixtures. 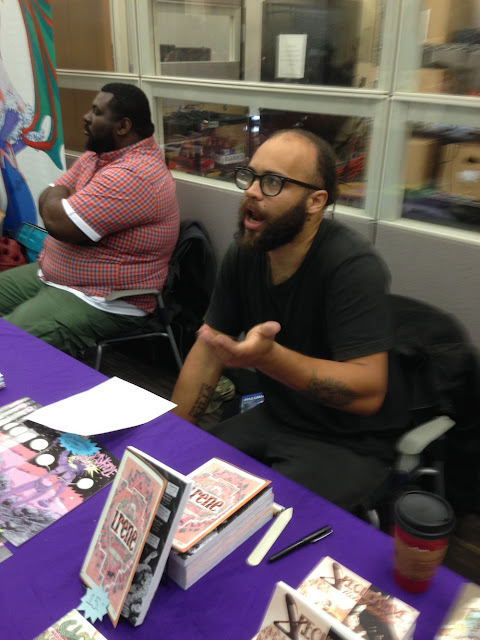 Displaying comics art is always problematic. Comics weren't meant to be seen vertically on a wall, like a drawing or painting. Some art is framed, like this beautiful Krazy Kat Sunday page. But much is displayed in vitrines and drawer systems that allow for more comfortable access and more artwork to be displayed. The latter quality is apparent in their system of vertical drawers. The fixtures were designed by Caswell, Robb and architect Peter Confar. Christopher Sperandio looks at a Calvin and Hobbes page in the vertical drawers. Another set of vitrines had a large glass encased top with cascading flat files below. Vitrines with cascading flat files. But my favorite fixtures was the simplest and one that other exhibition spaces could imitate inexpensively. These were sharply peaked vitrines. Robb told me, "The tent-deck cases are unique but were inspired by two sources: cases at the Charles Schulz Museum and a mummy case at the Metropolitan Museum of Art. The Schulz Museum has tent deck cases with rectangular hoods that have to be lifted off." "The mummy case was basically a large drawer that pulled out so that the glass never had to be lifted up. We combined the two. The cases were built by an Ohio company called Mock Woodworking." This clearly makes installation of new exhibits easier for the curators. But what I like about these is that they show you the art (in this case, issues of Puck, a key 19th century humor magazine) on a tilt similar to the way people actually read comics and magazines. You neither have to bend over to look at them (as with a typical vitrine), nor do you have to hold your head up (as with art on a wall). Furthermore, they are on a scale appropriate to most comics art (original or printed). Because this art is typically quite small (compared to paintings, for example), it can get lost on a wall. But these vitrines frame the work in an appropriately scaled structure. The museum has three galleries. The first one, with the vertical and cascading flat-files, is devoted to a general history of comics and cartoons in America, without going to deep into any one aspect. The second two can be used for a single large exhibit or two smaller exhibits. Right now, the exhibits are What Fools These Mortals Be! The Story of Puck, curated by Michael Alexander Kahn and Richard Samuel West, and Seeing the Great War, curated by Lucy Caswell. 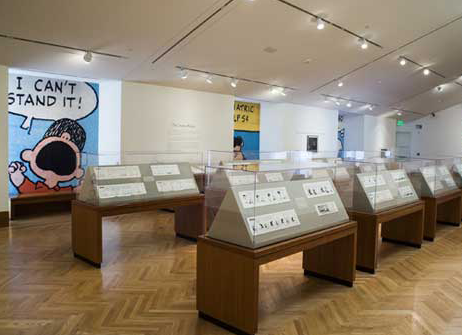 Previous exhibits have included Graphic Details: Confessional Comics by Jewish Women, The Long March: Civil Rights in Cartoons and Comics, and many solo shows by masters of 20th century comics. The vast majority of the exhibits feature old comics and cartoons, all the way back to the eighteenth century. The Billy Ireland Cartoon Library and Museum is not a contemporary comics museum, even though occasionally such work will be displayed. It takes its historical mission seriously. Not that there is no room for cartoon tomfoolery. Two very large gifts greatly expanded the collection. In 2008, it acquired the holdings of the International Museum of Cartoon Art, a museum founded by Mort Walker, creator of Beetle Bailey and Hi and Lois. He saw how badly original comic art was treated by syndicates and publishers so he started collecting the art himself in order to preserve it. That became the basis of the museum's collection. This museum was founded in 1974 and represents one of the first attempts to create a permanent museum of comics in the U.S. Initially located in Rye, New York (just outside of New York City), it built a larger facility in Boca Raton, Florida. However, sponsorship dried up and the museum was forced to close in 2002. 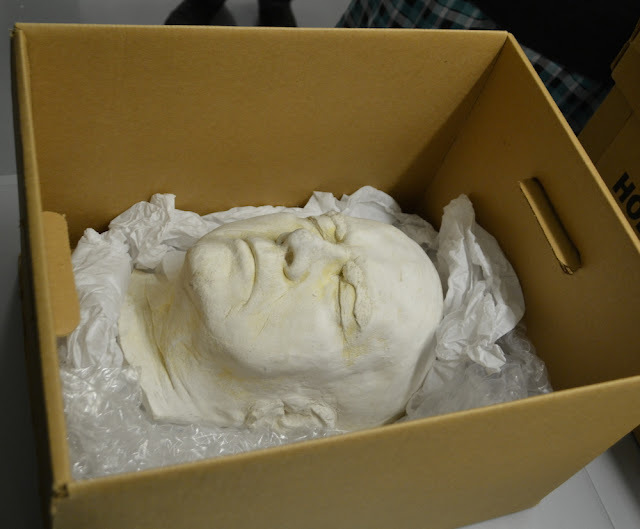 The work remained in storage as Walker attempted to find a way to revive it. In 2008, he made a deal with the Billy Ireland Museum, which now owns the collection, which consists of 200,000 pieces of original comics art (2/3rds of the Billy Ireland's total holdings of original art). The second collection I want to mention is the collection of the San Francisco Academy of Comic Art. This was founded and run by Bill Blackbeard in 1968. 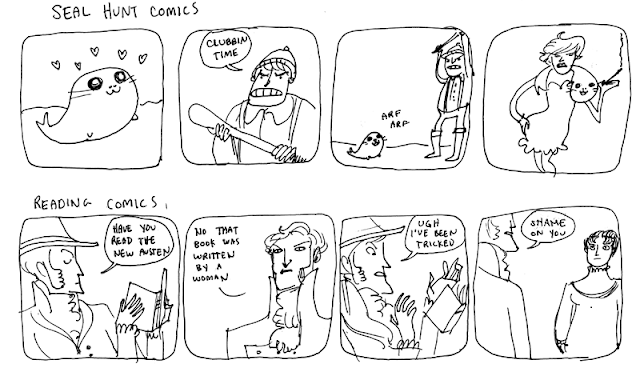 Blackbeard was one of those "amateur" comics scholars I mentioned above, working outside of academia. At a time when libraries all around the country were dumping their newspaper collections and replacing them with microfilm, Blackbeard went around and acquired the newspapers, whence he would clip daily strips for the Academy's collection. His collection eventually consisted of 75 tons of material. In 1997, he learned that he was about to lose his lease on the house where he stored the collection. He negotiated with Lucy Caswell to transfer the collection to OSU in 1998. The collection required six semi trucks to transport it from San Francisco to Columbus. It's impossible to overstate the importance of Blackbeard's single-minded labor. I know a lot of people in the comics world around my age had a life-changing experience when we read Blackbeard's The Smithsonian Collection of Newspaper Comics . 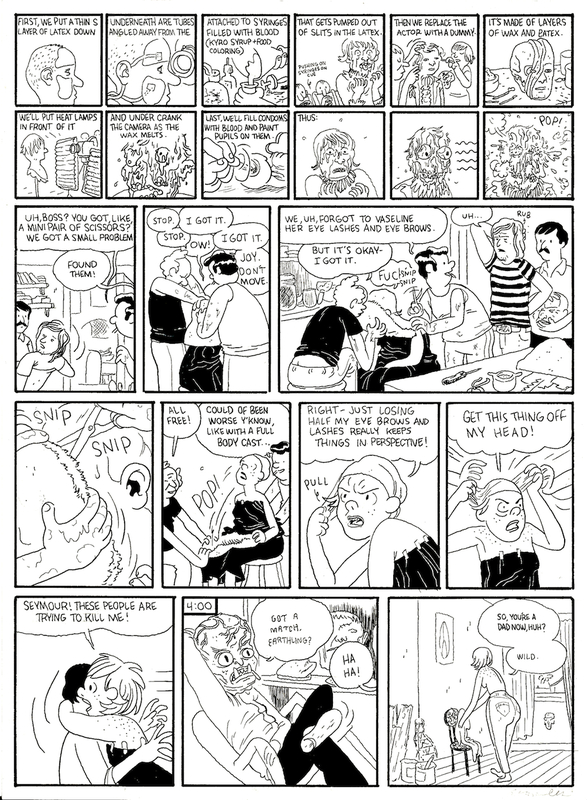 Jenny Robb has written about him in "Bill Blackbeard: The Collector Who Rescued the Comics". And Blackbeard features prominently in Nicholson Baker's book on newspaper preservation, Double Fold: Libraries and the Assault on Paper. The size of the collection is staggering. Robb told me, "We are constantly cataloging and digitizing this collection, but the sheer volume of materials in this collection (approximately 2.5 million comic strip clippings and newspaper pages) makes this a massive project. We will likely not finish cataloging it for many years and will never be able to fully digitize it without a significant investment of funds from a private source or a granting agency." Get out your checkbooks, people--this is important. Given these collections and many other smaller but also very important gifts the museum has gotten, it seems very unlikely that any comics museum or collection founded since will ever catch up. And that's fine--America should have one really great comprehensive comics museum, the comics equivalent of the Metropolitan Museum of Art. But there should also be regional museums devoted to comics and cartoons as well. If La Cité internationale de la bande dessinée et de l’image in Angouleme can have a fantastic museum with 12,000 well-selected pieces of original art, why not one here in Houston? Or one in L.A. or New York or Seattle? I think there is space for that in the comics world. Of course, comics museums have a bad history. In addition to the International Museum of Cartoon Art, there are two other comics museums that have gone missing. The Words & Pictures Museum was founded in 1990 by Kevin Eastman, one of the two creators of the Teenage Mutant Ninja Turtles. In its nine years as a physical museum, it had two locations in Northampton, Massachusetts. It had some good exhibits and a good collection of original art, but it was apparently unsustainable. It closed in 1999, becoming a virtual museum, and that virtual museum has not been updated since 2002. I don't know why it was closed, but it seems to have been for financial reasons. The Cartoon Art Museum still exists, but it no longer has a physical space. This museum, which has 7,000 pieces of original art in its permanent collection, has always been a shoestring operation. It has nearly failed several times in the past. Founded in 1984, it got cash infusions from Peanuts cartoonist Charles Schulz and later the Shulz Foundation that helped keep it from going under. (Schulz has clearly been a major factor in comics museums.) But its budget has never been large--according to their 2014 990 statement to the IRS, their revenue was $510,494 and their expenses were $527,491. Obviously this is unsustainable, but it is also indicates how cheaply they were operating. Of that $527,491 in expenses, occupancy (rent and utilities) was $229,056, by far their largest expense. It was a victim of San Francisco's rising rents. What the International Museum of Cartoon Art, the Words & Pictures Museum and the Cartoon Art Museum each show is that creating and sustaining a museum is hard. But it's obviously not that hard--the country is littered with thousands of successful museums, after all. So we have to admit to ourselves that the problem is with cartoon or comics museums in particular. Thus far, the Billy Ireland Cartoon Library and Museum has threaded that needle. One thing it has that the other three museums did not have is an association with a larger institution. Maybe that's the way to go. In some ways, I wish the Billy Ireland was an autonomous institution, because if it were, I could look at its tax returns and financials. But it is part of the university's libraries and hence part of OSU as a whole. As Jenny Robb told me, "We don’t have a separate 501c3, a separate board, or a separate budget. It’s impossible to separate our operating expenses from the rest of the OSU Libraries. For example, our book cataloging is done by the Special Collections Description and Access department, which does the cataloging for all of the Universities Libraries’ Special Collections. Our conservation work is done by a conservator who does work for all parts of the University Libraries. Similarly, our HR, facilities, IT, and accounting needs are met by the University Libraries staff in those areas. Our insurance is taken care of by the larger University." This position could come with a price in that the museum might be subject to the whims of OSU, but OSU's administration has been very supportive of the museum so far, up to and including building a dedicated facility. Our largest expenses are for staff and facilities. BICLM has 3 faculty librarians, 3 full-time staff librarians, and two part-time temporary project staff (in addition to the staff we share as discussed above). We also employ about a dozen OSU students part-time. Regarding facilities, the University Libraries “pays” POM (Plant, Operation and Maintenance) to the University on the square footage of our facility to cover maintenance and utility costs. I realize I may be losing some of you by delving into accounting issues, and I beg your indulgence. The reason is simple--the operation of a museum requires paying regular expenses, some of which can be quite high, and if you can't come up with that operating expense month after month, year after year, your museum won't survive. And that income has to come from somewhere. Robb said, "Most of our operating expenses are paid for by the University Libraries general funding (which mostly comes from the University since the Library is a support unit). However, we do have several endowments which help us to pay for things that are considered beyond the standard services that a library provides. We have an Operating Endowment with a principal of $2.25 million, as well as several other smaller endowments designated for specific things." It's up to OSU to come up with the money for the Billy Ireland for the most part, and OSU has a variety of sources of income. That's why I think if we are to have more comics museums/libraries, it will be through already existing institutions as opposed to stand-alone museums like International Museum of Cartoon Art, the Words & Pictures Museum and the Cartoon Art Museum. There are a few film and photography museums in the U.S., but most of the film and photography collected by museums exists as part of larger art museums. For example, the Museum of Modern Art in New York has a department of drawings and prints, of media and performance art, of painting and sculpture, of film and of photography. I mention MOMA because of an amazing thing I read by Robert Storr, who had at one time been chief curator of painting and sculpture at MOMA and is now the dean of the Yale University School of Art. 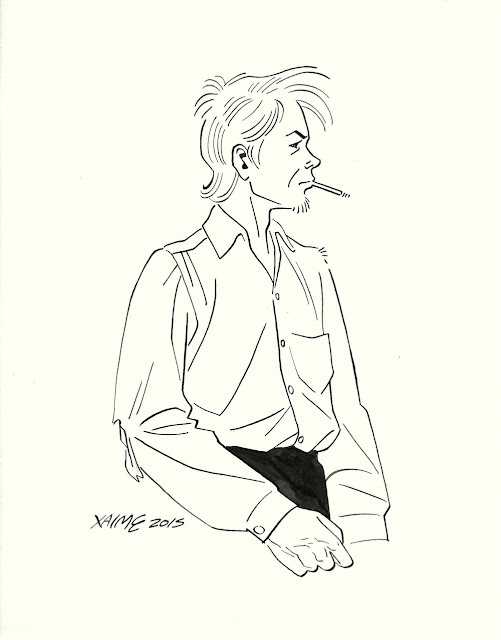 In the catalog for Co-Mix, the Art Spiegelman retrospective, Storr wrote that as the head of painting and sculpture at MOMA, he had advocating creating a new department--a department of comics. He saw it as the equivalent of the department of film, which is, as he wrote, "another genre whose identity is determined by the contradictions of its simultaneous existence as a means of artistic expression and of mass entertainment, its divided territory as a site of independent, artisanal invention and corporate, industrial production." Of course, there is no department of comics at MOMA. And as far as I can tell, MOMA has a small number of comics-related works in its collection. But MOMA could have been the OSU of a great comics collection if it had listened to Storr. The thing is that comics are not respected as art by existing museums. Museums aren't able to make the distinction that Storr makes above. This is a process that hasn't reached a stage where museums can climb aboard. Norton Dodge, writing about nonconformist art from the Soviet Union, wrote the following: "No [U.S.] museums [...] were ready to exhibit art that was not already accepted by art critics and art historians " in the late 70s when this work started to become known in the West. His solution was to show nonconformist art from the U.S.S.R. for 15 years at colleges and universities, where the barriers were lower and from where one might hope to build up an institutional appreciation for this kind of art. (Dodge was ultimately quite successful, and now Ilya Kabakov, for example, is considered one of the greatest living artists. Dodge's own personal collection found a permanent home at Rutgers University.) Comics are in the same boat. Neither MOMA nor any other museum is going to collect comics art deeply unless not doing so would be an embarrassing example of art-historical neglect. And we are far from that day. So additional stand-alone museums are unlikely, and major comics collection in existing museums are also unlikely. What else? One way comics have been successful at preserving its own history is in libraries. After all, the Billy Ireland didn't start out as a museum. It started out as an archive. And such archives and collections exist in libraries across the U.S., starting with the Library of Congress (which as we saw above competed with OSU for Caniff's papers). Other comics archives and collections around the country reside at Columbia, Virginia Commonwealth, the University of Wyoming, Michigan State, Washington State University, etc. Some of these collections put on exhibits, but mostly these collections exist as sources for scholars and students doing research. We are indeed in our early days. I started the circulating graphic novels collection 10 years ago, and the expansion into archives only began five years ago when Chris Claremont contacted us to see if he could donate his papers. After we took his papers, I was empowered to seek out other collections, in order that Chris' papers exist in a scholarly context. So, in that sense, Chris' papers served as the initiating spark, as Caniff's did for Billy Ireland. Columbia's collection now has the Elfquest archives, the papers of New Yorker cartoonist Charles Saxon, the archives of the Pulitzer Prize (including the prize for editorial cartooning), Al Jaffee's and Jerry Robinson's papers, and much more. Like the Billy Ireland, they depend on the generosity of artists and collectors. Most of it exists in the Butler Library's Rare Book & Manuscript Library at Columbia. It's an impressive start, but not yet large enough to justify its own curator. Green wrote, "I was hired as, and still am, the librarian for Ancient & Medieval History. Graphic Novels Librarian, Adjunct Curator for Comics and Cartoons--these are titles I've acquired but for which there is not currently a salary line. I'm not even an employee of RBML!" She said her long-term goal was to raise money to endow a position of comics librarian. And this seems key. Columbia will continue to administer the collections it has and because of Green's ongoing efforts, acquire new collections. But without a full-time salaried position of "comics librarian" or "comics curator", there is no guarantee that the active curation of the collection will continue after Green retires. (Not that this is imminent.) I would suggest that this is an issue at any university comics collection. I suspect Virginia Commonwealth's collection is safe from neglect because that library clearly sees it as a thing unto itself. But that doesn't seem to be equally true in every substantial university collection. Still, you have to start somewhere. Lucy Caswell's first job in this field was on a six month contract, after all. These things are provisional and fragile up until the moment they aren't. Obviously it will be impossible for any other library collection to catch up with the Billy Ireland, which is why some focus on specific collections. For instance, Columbia is specializing in work from New York City. 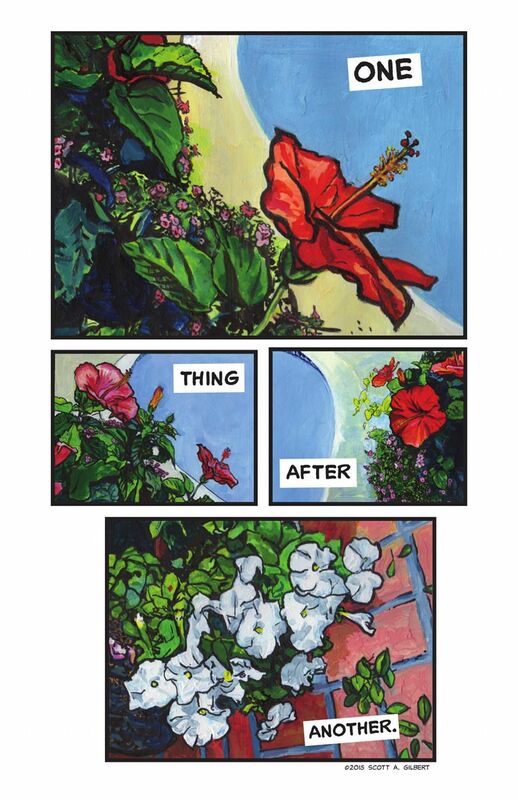 Washington State's collection focuses on underground comics and self-published/small press comics. This collection was founded by former librarian Steve Willis, who was also a giant in the field of mini-comics. Washington State's collection is one that seems somewhat fragile. 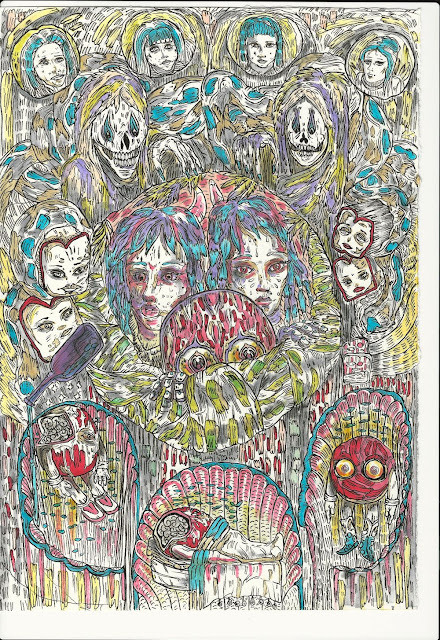 It consists of seven individual collections, mostly donated by key minicomics artists, including Willis, Clark Dissmeyer and Jeff Zenick. If you go to the Special Collections website, these collections are listed together, but there is no dedicated "Small Press and Underground Comics" webpage. Greg Matthews is the librarian in charge of WSU's underground comics collection, but like Karen Green, this is not his only job. (He has a humorously postmodern job title: Metadata Librarian.) He said that the library sees this as a collection, and internally it is referred to as the "WSU Underground Comics Collection." The collection is almost all published material; it contains very little original art. That said, this may be some of the rarest comics material collected in any library, given that most minicomics had print runs in the tens. It attracts scholars, students doing research and is used in various classes from time to time, which is pretty much what you want from a special library collection. But this may be as far as it goes. When I asked Matthews about expanding the scope of the collection, he said simply, "This issue is the subject of ongoing discussions." Robb described the Billy Ireland's cooperation with other comics collections, specifically mentioning cooperation with the Comic Art Collection at Michigan State. Karen Green said, "Back in 2011, after Chris Claremont donated his archives, I had a conversation with Jenny Robb, and we defined our scopes, exactly to avoid that kind of competition: Columbia's focus is very much on NYC-area creators." But let's face it, WSU, which is always looking for appropriate collections to add, is in competition with the much larger, much better-known Billy Ireland. This will be a challenge for any library or museum that chooses to collect comics. I have developed a formula for a successful comics library/museum. A supportive institution (like OSU) + a visionary librarian/curator (Lucy Caswell) + time (38 years and counting) = a great comics museum. This combination has only really been achieved once, although we may be seeing it replicated in places like Columbia. It seems likely that the next successful comics museum will be part of a university. Eventually some major museum will follow Robert Storr's advice and develop a department of comics. And I hope someday an autonomous museum of comics similar to La Cité internationale de la bande dessinée et de l’image is successfully established in the U.S. But for now and probably forever, the Billy Ireland Cartoon Library and Museum is the most important library and museum of comics in the U.S. If you are interested in comics or are part of the comics world, you owe it to yourself to visit the Billy Ireland. Welcome to The Great God Pan's first podcast. Please excuse my learning curve. In this episode, I take a trip to Columbus, Ohio, to experience the first-ever Cartoon Crossroads Columbus (aka CXC) festival. The photo above is a life mask of Milton Caniff which is property of the Billy Ireland Cartoon Library & Museum. Lumberjanes Vol. 1 by Shannon Watters, Kat Leyh, Carolyn Nowak, Noelle Stevenson, Brooke Allen, etc.